This very unusual name is both locational and topographical. It derives from a place in Surrey which is now "lost", but was formerly recorded as "Anecknappe". The Translation is believed to be the "valley of the wild duck", certainly "Knappe" refers to Valley, although the prefix is arguably an Olde English personal or tribal name. What seems clear is that sometime around the 15th century the inhabitants of the village left en masse either as a result of plague or more likely under duress as a result of the Enclosure Acts which greatly reduced the common land available for grazing. The former inhabitants "adopted" the name of their home as their surname, a development which lead directly to the variant spelling forms. 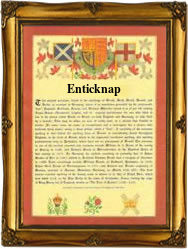 The early recordings of the name include Thomas de Enticknappe in 1332, who was probably the Lord of the Manor, whilst George Enticknap who appears in the London rolls of 1696 was certainly not. Other recordings include Ann Enticknapp married William Harwood at Brambean, Hampshire on June 20th 1699 and John Enticknapp christened at Bramshot, Hampshire, on August 27th 1703. On October 31st 1758, John Binstead, who married Mary Enticknap at Chalton, Hampshire. The first recorded spelling of the family name is shown to be that of Thomas de Anteknappe, which was dated 1332, in the "Surrey County Pipe Rolls", during the reign of King Edward 111, known as "The Father of the Navy", 1327 - 1377. Surnames became necessary when governments introduced personal taxation. In England this was known as Poll Tax. Throughout the centuries, surnames in every country have continued to "develop" often leading to astonishing variants of the original spelling.